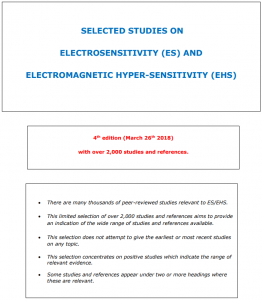 If anyone is wondering if there is scientific evidence of the health effects of electromagnetic fields please download and read this paper (Electrosensitivity UK, March 2018) on Electrosensitivity & Electrohypersensitivity Studies. It is also useful to send to anyone who questions the link between electromagnetism and the health of biological systems. It is a very useful reference of 2,000 Electrosensitivity & Electrohypersensitivity Studies.